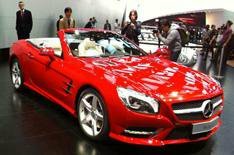 Detroit motor show 2012: Mercedes SL | What Car? The 2012 Mercedes SL is longer and wider than the current SL, but the new model (the sixth-generation SL) has an all-aluminium body that makes it significantly lighter. It has a range of more powerful, yet more frugal, engines and will be available with a raft of new high-tech features. Although it has a similar overall shape to the outgoing model, the new SL has a longer body, with more sculpted sides and a prominent front grille. As with the current car, theres an electrically operated folding metal roof. It's available with a choice of a conventional painted finish or with a glass panel, however. Theres also the option of a glass roof with Magic Sky Control, which switches from light to dark at the touch of a button. The interior clearly shows the influence of Merc's SLS AMG supercar, with a similar design and circular air vents. Mercedes says the new SL provides more shoulder room than the current car. Initially, therell be a choice of two petrol engines: the SL350 has a 302bhp 3.5-litre V6, yet it's nearly 30% more economical than its predecessor. The SL500 has a 429bhp 4.7-litre V8 that uses 22% less fuel than the current model's. Both versions come with engine stop-start systems and a seven-speed automatic gearbox. Two suspension set-ups will be available a semi-active adjustable damping system and an optional system with active body control. The new SL will introduce two new high-tech features to the Mercedes range; FrontBass and Magic Vision Control. FrontBass is an audio system that uses the areas in front of the footwells as resonance spaces for the bass speakers. Mercedes says that it gives crisp, clear bass sounds, even with the roof down. Magic Vision Control is a new windscreen wash/wipe system, with a wiper blade that applies washer fluid just in front of the blade, in both directions of the wipe. Mercedes says that no water is splashed on the screen, so visibility is not disrupted. The water doesnt spray into the cabin when the roof is down either, while a heated wiper blade will be available as an option. Full pricing and technical details are yet to be confirmed, but all versions are likely to be well equipped and wed expect a starting point of around 65,000. The new Mercedes SL goes on sale in July. The new Acura NSX supercar has been revealed at the Detroit motor show 2012. The Audi Q3 Vail concept car has been unveiled at the Detroit motor show 2012. Chevrolet has unveiled two coupe concept cars at the Detroit motor show 2012: the Tru 140S and Code 130R. The Hyundai Veloster Turbo was unveiled at the Detroit motor show 2012. The Lexus LF-LC concept car has been revealed at the Detroit motor show and previews how the next generation Lexus models will look.